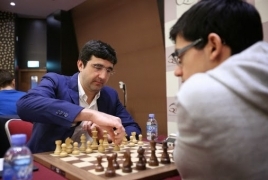 PanARMENIAN.Net - Former world champion Vladimir Kramnik (43) has announced that he will end his career as a professional chess player, the official website of the Tata Steel Chess Tournament said Tuesday, January 29. Kramnik was world champion from 2000 until 2007. He dethroned Garry Kasparov by beating him 8.5 – 6.5 in 2000. Kramnik didn’t lose a single game during this world championship match. He has won virtually all top tournaments, including the Tata Steel Chess Tournament (in 1998). Armenia's top chess player, grandmaster Levon Aronian said in a tweet that it's a sad day for chess. "Another giant leaves the game earlier than we all would hope for.Vladimir Kramnik leaves an incredible legacy behind him. Almost every opening line played in last 25 years has his major input," Aronian said.